Fete Boutique, a London based ecommerce company specialising in handmade gifts for baby parties and bay showers. 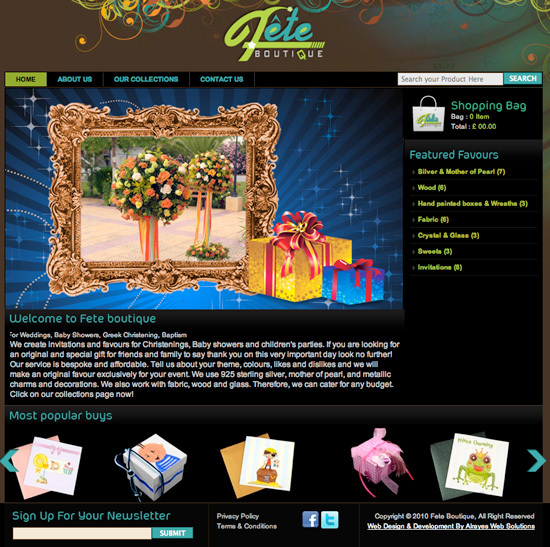 We worked closely with Fete Boutique to come up with a website that will work for their customers. I would like to say a big thank you to everybody for creating a wonderful e-commerce for my new business, which is both beautifully designed and flows really well. Also they created stunning designs for my company box, cards, labels, and tags. I can not praise enough their professionalism and work ethic. All my ideas were incorporated into the design and function of the web-site which makes it truly bespoke and not mass produced. In addition, Wasim the project manager dealt with everything promptly and efficiently, he is an extremely hard working man,as they all are in the office, he answered all my questions clearly and offered advise. I truly recommend you to everybody, they are honest and they will get out of their way to produce an end product that you are proud of. I will definitely be doing business again with them soon.